California Gov. Arnold Schwarzenegger addresses the public. Can Detroit Live With New Fuel Rules? Environmentalists harbor no illusions about the Bush Administration. From a 2001 decision to weaken regulations on arsenic in drinking water to its antagonistic performance at last week's U.N. climate change talks in Bali, the White House has consistently opposed green goals. But Wednesday's move by the Environmental Protection Agency (EPA) denying California and 16 other states the right to set their own standards for carbon dioxide emissions from automobiles was an unpleasant surprise, even by Bush standards. The announcement, made by EPA Administrator Stephen Johnson, temporarily torpedoes state efforts led by California to drastically reduce CO2 emissions from cars by treating the greenhouse gas as a pollutant that could be regulated like any other. The California initiative, part of the state's landmark climate change plan, could have provided a nationwide model for cutting automobile emissions, one of the single biggest sources of greenhouse gas in the U.S. "The Administration has done a number of indefensible things on the environment and global warming," says Jim Marston, director of the state climate initiative for Environmental Defense. "But this is the worst in terms of process, and the one that will be most harmful to the health and safety of the American people." The EPA's action came after California had waited nearly two years for federal approval of its new auto regulations. Under the Clean Air Act, California has the right to pass auto emissions standards that are tougher than federal ones  a recognition of the state's historical struggles with air pollution. In this case, the state proposed rules that would have required automakers to reduce greenhouse gas emissions by 30% in all new cars and light trucks by 2016, beginning with the model 2009 year. All California needed was a waiver from the federal government, which has been virtually automatic over the past decades  until this decision, the first time the EPA has said no. "It's absurd," says Michelle Robinson, director of the clean vehicles program for the Union of Concerned Scientists. "There is no reason for the Administration to squash this program." The EPA's Johnson argued that California's regulations had been preempted by national fuel economy legislation just been signed into law by President Bush, which requires all new cars and trucks to meet a toughened 35-mpg standard by 2020. He also contended that CO2  unlike the pollutants that cause smog and other local problems  causes an essentially global problem, and therefore California's request didn't meet the "extraordinary and compelling" justification needed for a state waiver under the original Clean Air Act. "The Bush Administration is moving forward with a clear national solution  not a confusing patchwork of state rules," said Johnson. "I believe this is a better approach than if individual states were to act alone." But that's simply not true. The new national fuel bill sets 35 mpg as a federal fuel economy floor, not a ceiling  and in any case, California officials contend that their rules would require at least 36 mpg by 2016, with room to grow. The idea that there would suddenly be a "patchwork" of state CO2 regulations seems unlikely as well, since only California has put forward its own standards, with 16 other states ready to adopt Sacramento's rules, in line with California's role as a national leader on environmental regulation. And several recent court cases have recognized the right of states to regulate CO2 as a pollutant like any other. The fact that at international climate meetings the White House has actually advertised state efforts like California's as evidence of American action on global warming only adds to suspicions that the EPA's ruling is essentially political. "If dealing with the most serious environmental threat of our time in our biggest state tackling its largest source of greenhouse gas pollution isn't extraordinary and compelling, I don't know what those words mean," says Marston. California Gov. 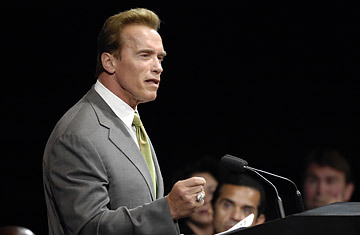 Arnold Schwarzenegger sharply criticized the EPA, and announced that the state would seek to overturn the decision in court. They'll have a strong case  Johnson's own lawyers in the EPA argued that the agency would be unable to defend the move, the Washington Post reported. But it's likely to take half a year or more for the case to make its way through the courts, delaying efforts to control greenhouse gases. Coming after a string of relative victories for the environmental movement  the first federal climate change bill just passed out of committee, and the new energy bill represents the first increase in fuel economy standards in decades  the EPA move is especially disheartening. "It's going to take time, and it does set back progress," says Robinson. "But there's going to be a wave of opposition to this." That wave is already growing throughout the U.S., where state and local governments have taken aggressive steps on global warming in the absence of federal guidance. But the EPA's decision leaves little doubt that the Bush Administration, with a year left in office, has no interest in meeting environmentalists halfway  or perhaps, at all. "This is the Administration showing its true colors," says Robinson. "They're attempting to undercut progress even as they get ready to walk out the White House doors." Change is on its way, but 2008 may be a lost year for global warming, at the very moment when we can't afford to lose a day.